This is a quite long film (almost 3 hours) but you don’t really see the time pass by as it is very poignant and gripping. The scenario is well constructed, acting is excellent as well as film direction. There are some glitches (like a wound in the girl’s hand that appears completely healed in a scene then is shown again with a bloody plaster on it in the next one) but they are very minor. 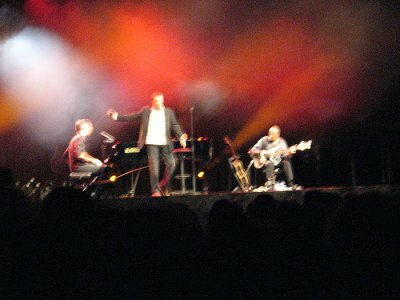 Yeah, me and Avi we attended Julien Clerc’s concert! Not really our style of music but it was quite cool actually. The guy definitely has a good voice and knows how to use it and to get the audience to sing too (on ‘Quel Jeu Elle joue’). His lyrics are quite interesting as well, very poetic and the engaged type. Though I can’t stand ‘Femmes Je vous aime’ the other songs like ‘Utile’, ‘Melissa’, ‘Double Enfance’ were enjoyable. A special word about the two musicians who were incredibly versatile (each one plays at least four different instruments – guitar, bass guitar, flute, synth, piano, melodica, etc.). Julien also played the piano very well (even made a mistake and humbly said ‘pardon, pardon’ before starting again the song…). The Centre was actually quite packed though there were a number of places left. The technical setup was well done (some glitches in the filming though).